This is the softest, most delicate and fluffy mamon. 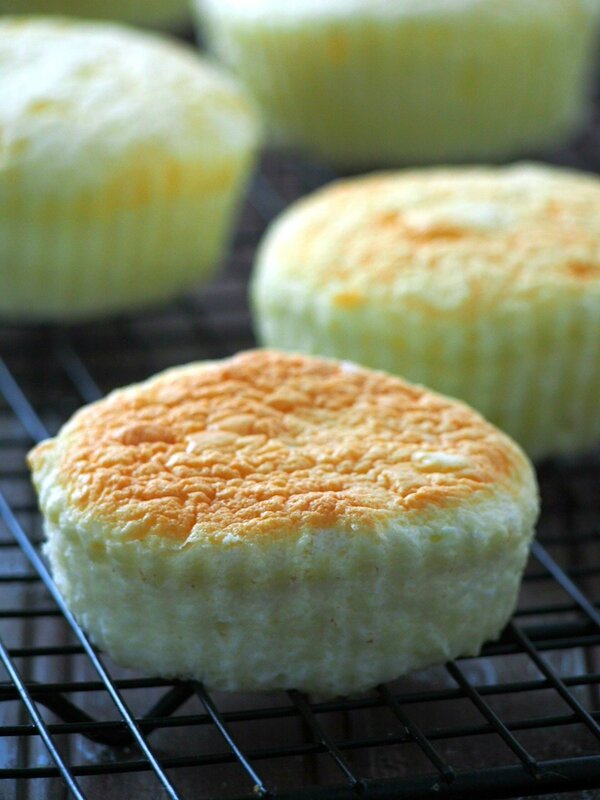 These mamon recipe has a hint of cheese brought by the cream cheese and can be made even more special by toppings of melted butter, sugar or grated cheese. If you have been following along, I actually went through to stages before I arrived at this perfect mamon recipe. I had my first trials and second, and now I am confident that we have come to a happy place with these soft and fluffy mamon. See those posts and the photos? Oh the early days of blogging! The photos are eeeeeek, and the words are much eeeeeeeeker! Anyways, the business, selling thing I wrote there? It no longer applies. I am now in a happy state of food blogging, developing recipes and sharing them to you all. So now, I offer you our delicious mamon recipe, your favorite. I am in awe of how you guys love these because I totally enjoyed those early days of making it. It is now with better pictures and with step by step instructions. A version 2.0, if you will. I also made alterations because you were not too crazy about the shrinking of these mamon. I altered the recipe using one of the readers’ tip and it is perfect. Let get right to it, shall we? The first step is to set up a double boiler. No, calm down. It is just a glass bowl set over a pot of simmering water. Bring a pot with about 3-4 inches of water to a simmer. Maintain the simmer by using low to medium heat. 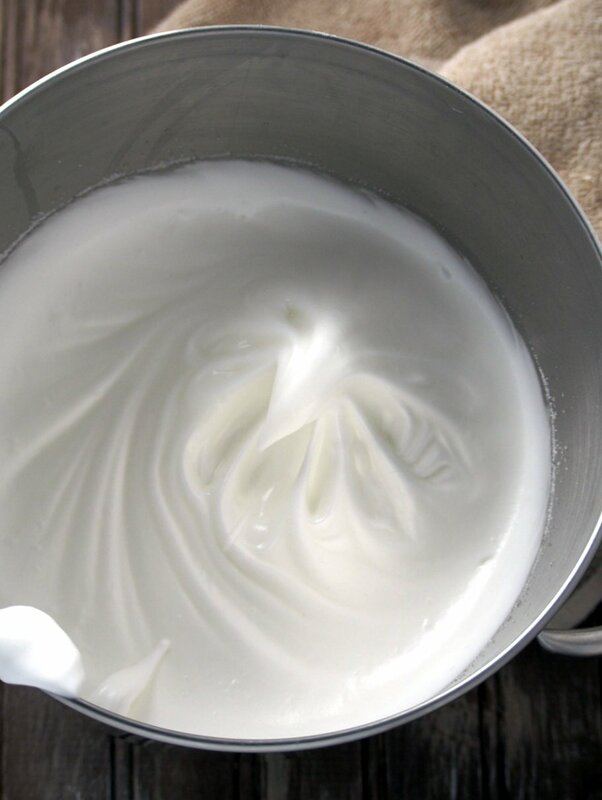 Place your cream cheese, butter, milk and canola oil in a heatproof glass bowl. Set that glass on the top of the pot. It should be a bowl that fits perfectly. Check that the water is not touching the bottom of the bowl. If it does, carefully remove some. 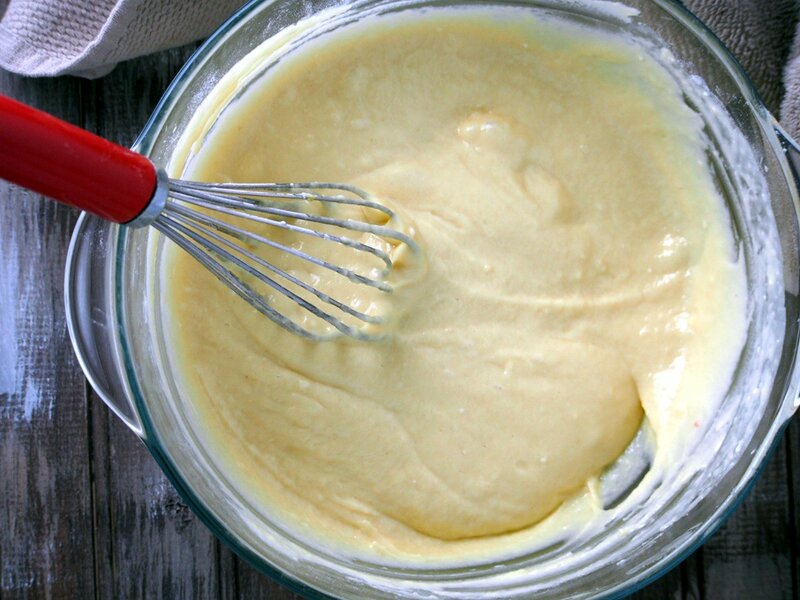 Whisk the mixture often until the butter and cream cheese melt and the mixture is smooth. Let cool. Add the egg yolks and stir them into the mixture. Then combine the flour and baking powder and sift it over the yolk batter. Use a whisk to stir the mixture until it is smooth and lump- free. 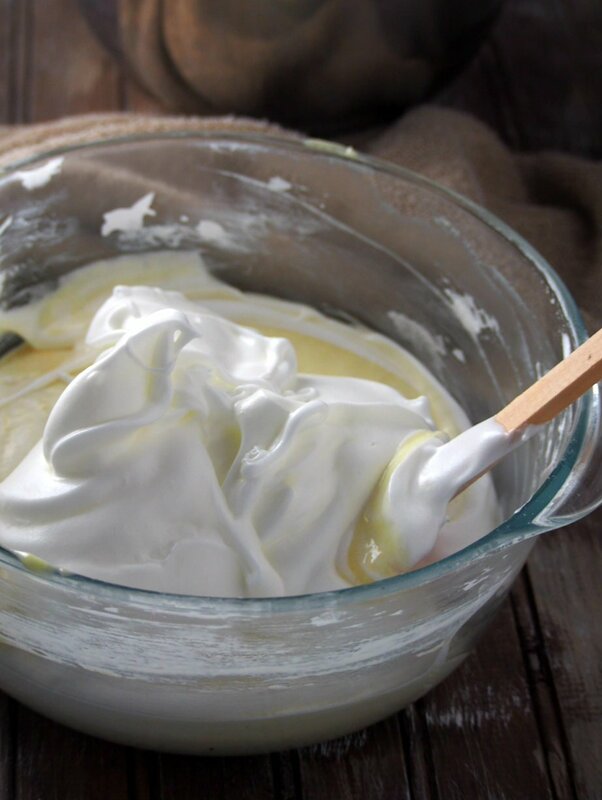 In a bowl of a stand mixer, or use a hand-held mixer, beat the egg whites until frothy. Add the lemon juice and beat until soft peaks form. Add the sugar gradually while beating, until the egg whites form firm peaks. Fold the egg whites to the yolk batter using a spatula. Add 1/3 of the batter at a time. Incorporate the mixture by making gentle swipes and scoops until the batter is uniform in color. Spoon the batter gently into large baking cups. The ones I use measure 4 x 4 x 3 inches. My trusty baking cups are these silicone ones. They are my official mamon molds. They make the perfect size plus they are multi-purpose for making muffins, gelatins and even as brioche molds. Arrange the cups in a large rimmed baking pan or a roasting pan. Place it in the center rack of the oven. Gently pour water into the roasting pan until the baking cups are about 1/3 submerged at their bottom. Bake the mamon for 25-30 minutes or until a toothpick inserted at the center comes out clean. Turn off the oven and leaving the oven door slightly open, let the mamon stay inside for about 3 minutes. This helps minimize shrinking. Take them out and let them cool on a wire rack. To serve, remove them from the molds for a real mamon feel. And behold, soft, buttery, moist and fluffy mamon. I am positive that you will love these! Those wrinkly tops will subside as the mamon cools. Give it time and they will be the perfect looking, softest mamon that you make. To store them, or to give them as gifts, I wrap them individually in plastic wrap. You can then place them in a cake box or in a tightly covered container. 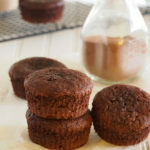 You can use regular sized muffin molds. Just reduce the baking time. About 12-15 minutes is a good starting point. If you want to use a muffin pan, use cupcake liners and set the pan on a large roasting pan so you can still bake it in a water bath. This is the recipe for the softest, fluffy and most delicate mamon. 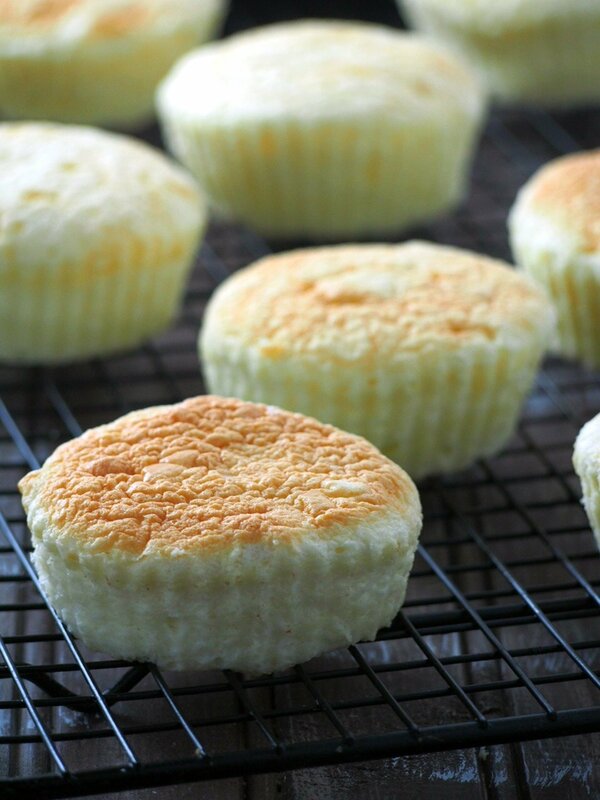 Buttery with a hint of cheese, these moist little cakes will truly delight you. Fill a cooking pot with about 3-4 inches of simmering water. Bring the water to a boil, reduce the heat and let it simmer. 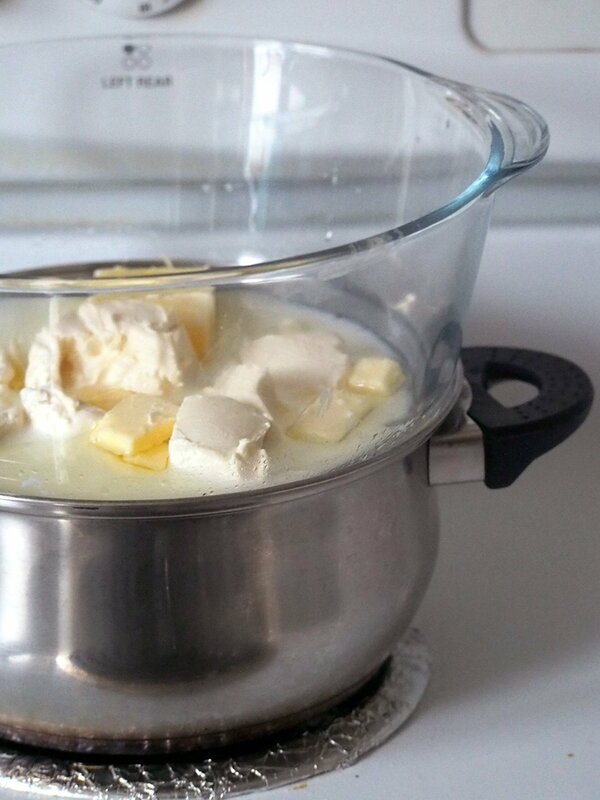 In a heatproof glass bowl, add the butter, cream cheese, milk and canola oil. Place the glass bowl on top of the pot of simmering water. It should be a bowl that fits perfectly over the pot. The simmering water should not be touching the bottom of the bowl. If it does, you need to lessen the amount of water carefully. Whisk occasionally until the butter and cream cheese has melted and the mixture is smooth. Let this cool. 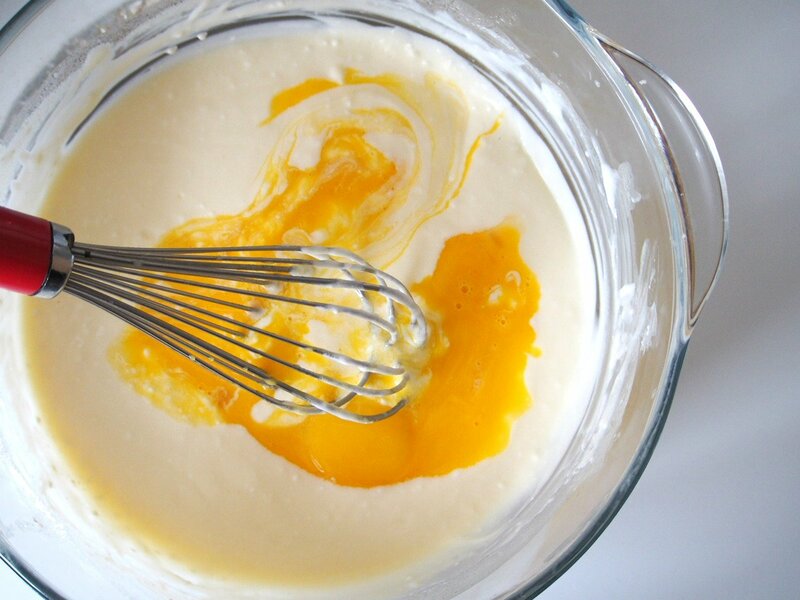 Add the egg yolks to the mixture and mix it with a whisk until smooth. Sift the flour and baking powder over the egg yolk mixture. Mix until smooth. Preheat oven to 350 F.
Using a stand mixer or a handheld mixer, whisk the egg whites until frothy. Add in the lemon juice and continue whisking until soft peaks form. Gradually add sugar in small amounts until stiff peaks form. Gently fold the egg whites into the egg yolk mixture , ⅓ of the egg whites at a time. The final mixture should be uniform in color. 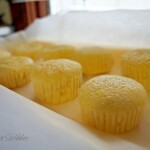 Spoon the batter into 12 large muffin molds. I used these silicone cups*. Arrange the cups in a large rimmed baking pan or a roasting pan. Place in a 350F preheated oven. Gently pour water into the roasting pan until the mamon molds are 1/3 submerged at their bottom. Be careful not to pour any water into the cups. Bake for 25-30 minutes or until a toothpick inserted into the middle a mamon comes out clean. Turn off the oven. Leave the oven door slightly open and let the mamon sit for about 3 minutes inside. Take them out and cool on a wire rack and if desired, remove from cups before serving. 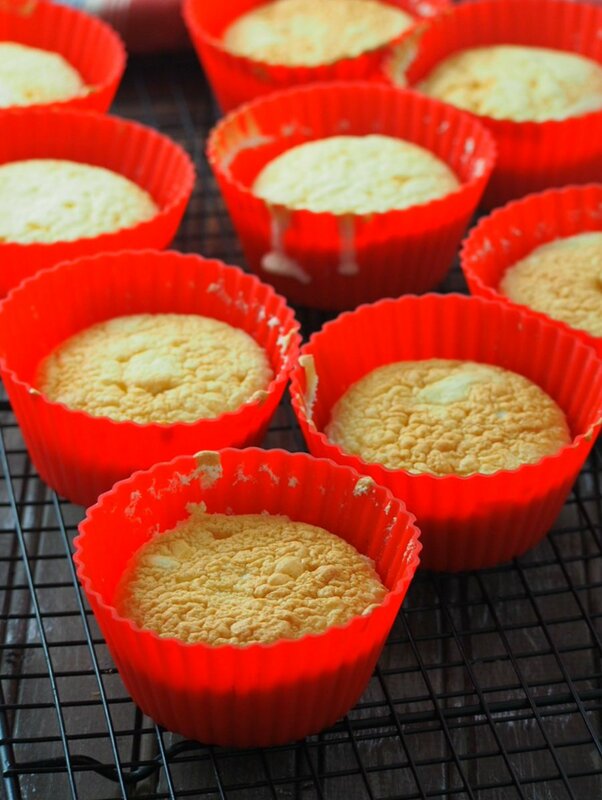 You can also use regular sized baking cups instead of big ones. Just reduce the baking time to 12-15 minutes. If you are using a cupcake pan, line it with cupcake liners and set it over a larger rimmed baking pan where you can put the water. If you make this, please use hashtag #womanscribbles on Instagram or tag me @sanna.womanscribbles. I would like to see your baking! This post contains affiliate links. See my Disclosure Page to learn more. Hello kate! Thank you for visiting! Kisses to adee and regards to everyone! God bless your family! Happy new year sa inyo! Hello Dories! Thank you for your question. Usually, I wrap them individually in wax papers, then put them in a box or a covered container. This is especially helpful if you are going to transport them so they will remain fresh longer. Or you can just put them straight in a covered container. They remain fresh for 2-3 days at room temperature. Longer than that, I put them inside the fridge. Thanks again, Let me know how it turns out. I hope you enjoy them. Thanks for the tip Sanna! And yes I will definetely make them this weekend. Love love love your recipe.. super yummy and fluffy! Thanks for sharing! You are very welcome! I am very happy that you liked it, Doris! Yes Sanna..so yummy that friends are now ordering from me. Not sure if I want to sell them. First I’m not sure how to price it and second like you said it can be very exhausting. But I’m happy they love the mamon as much I do. Wow, I am happy its turning out well. About the selling, why don’t you give it a shot? You might enjoy it after all! Good Luck and thank you so much for keeping me posted! My daughter Victoria loves butter mamon from Red Ribbon. I will try your recipe and bake it (Baine- Marie). Let me see how it goes with her palate. Thanks a lot. Hello! Red Ribbon’s butter mamon is also my favorite. It was not as fluffy as your end product. What did I do wrong and how can I make it as fluffy as yours? Hello There! Thank you for trying the recipe. At times when I make this, sometimes it as not as fluffy as I would like. There is always a level of shrinkage once the mamon cools down. Similarly, in the same batch, there are some fluffy ones and some are not. What I do to get them fluffy as possible is to fold the egg whites into the batter uniformly so the consistency of the batter is the same all throughout. With that said, I believe you are not doing anything wrong. This mamon is so delicate that at times, it shrinks more than it needs to. Hi Sanna. Im planning to try your mamon recipe. I just want to k ow if you used salted or unsalted butter? Hi Fe! I used unsalted butter. Thank you and happy baking! Thanks for the sharing recipe. 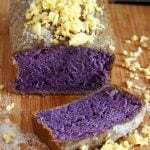 From the picture and your sharing I really believe that I found the exact mamon recipe that I want. It’s hard for me to keep on asking anyone of my friends from Philippines to buy for me the Mamon from the Red Ribbon. In my country some of the bakery shop sell mamon but I’m not really satisfied with it. I really would like to try your recipe soon. Thanks again! I tried your recipe today and I really loved it! Thank you so much for sharing your Mamon recipe. 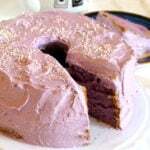 I hope you can share more yummy baking recipes. Hi Sanna! Thank you for sharing your yummy mamon recipe. I cant wait to try this. Is it while milk or evap? Hello Glece! You will love these! I used the regular cows milk (white), not evaporated. Hi Sanna! 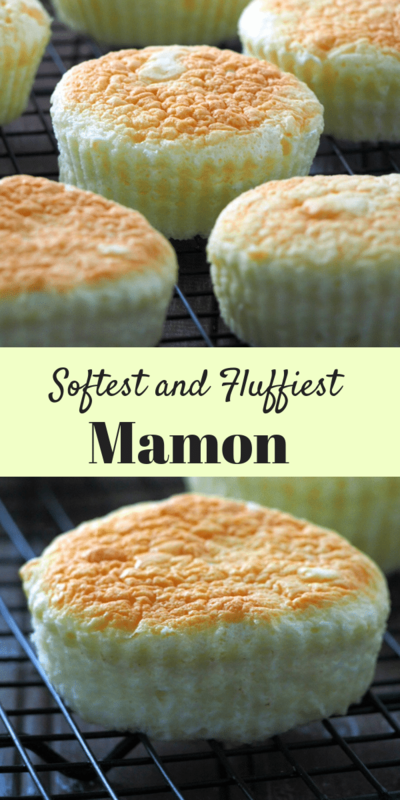 Thank you so much for sharing this soft and yummy mamon recipe. I tried it 2x, the first one I followed the directions exactly and my picky son said that it’s good but not that great for it’s so eggy and most of them shrink. So I tweaked the recipe a little bit on my second attempt . I only used 7 eggs, added 1/4 cups flour, 1/4 tsp of baking powder and 1 tsp of lemon rind and it’s perfect. None of them shrink and it’s still soft and heavenly without the eggy feel Topped it with melted butter and sugar. We all enjoyed eating it. Good luck … God bless you and your family. Hello Sybel! Thank you very much for trying the recipe. I am glad that you liked it. I also appreciate your feedback and for sharing your alterations in the recipe because they help a lot. These tend to shrink, you are right and your alterations might just be the perfect one to offset that. Thank you and God bless you too. What is the brand of the silicone cups you used for your mamon? They are Hamilton Beach, texas size is what it says on the packaging. I hope that helps! Thank you and happy baking. My friends loved the mamon I made using your recipe that they want to order but no idea how to charge them? Do you have an idea how much should I charge for it? Yay! I am so glad that they liked it. When my friends ordered these a few years back, I remember charging 12 cad per batch. I was pretty sure I was undercharging that time, though. There are baked goods cost calculator online if you want to take things to the next level but if you get casual orders now and then, around 12 cad or so is a good place to start 🙂 It really depends on where you live, though and the cost of ingredients there. Just my thoughts 🙂 And good luck! I love baking these. Hello! super excited to make it. Can I substitute the oil to coconut oil? Hi Joyce, I have not tried that so I cannot tell for sure. But I am positive that it should be fine. Only alters the taste a bit:) Let me know how it goes and good luck! OMG! I’m going to divorce my husband and marry you! How many mamon will this recipe make? out dry and not so soft and fluffy? Hello there! This recipe will yield 12 mamon pieces. 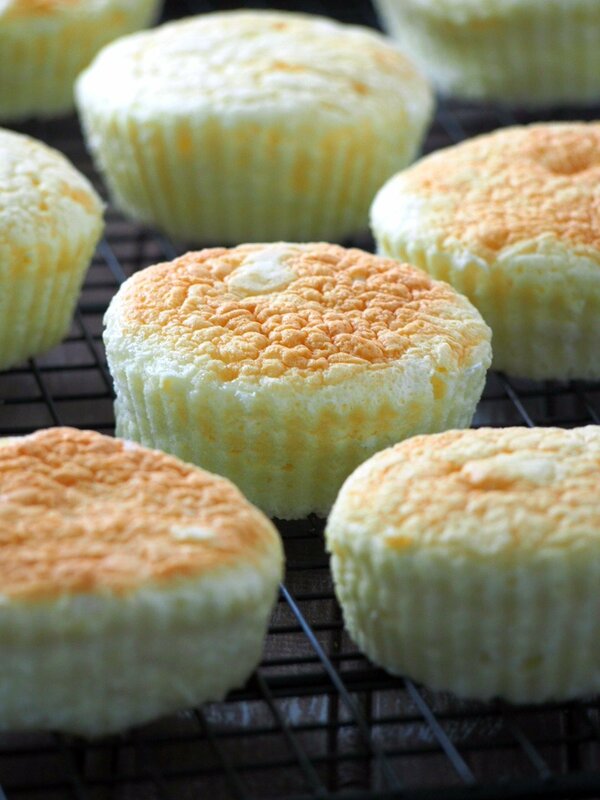 Mamon are, by theory, sponge cakes and they are cakes that are on the airy side than moist. 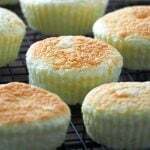 Some recipes alter the sponge-like texture of mamon by turning them into chiffon cakes with added butter or oil in the recipe. However, rest assured that this recipe will yield soft and moist ones of you follow it! Happy baking! Hi Maria! 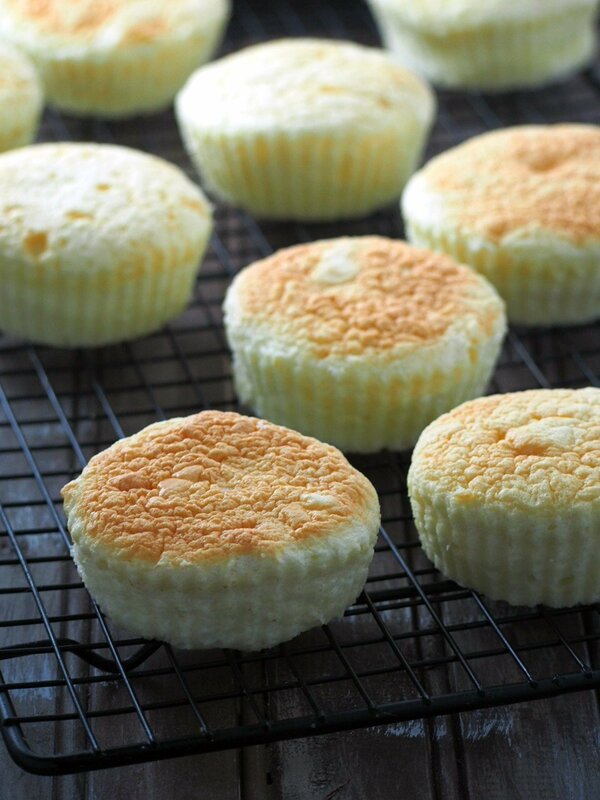 That is right 🙂 The method used here is the same for making Japanese sponge cake. I hope you enjoy them!